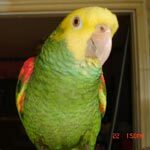 Parrot Forum • View topic - Female cockatiel is egg bound. Female cockatiel is egg bound. Re: Female cockatiel laying egg or constipated? Diagnosis from the vet: she is indeed egg bound. Just one, big egg. They're keeping her overnight to give her oxygen, warmth, and a few injections. The egg is slightly tilted and a bit large, especially for her first egg. If she doesn't pass it, then we have to see a specialist. Here's to hoping, and thanks for your help! No sign of the egg as of this morning. She just refuses to lay it, I guess. Re: Female cockatiel is egg bound. Please suggest to the vet that they collapse it. This only works if the shell is soft though but that is usually the reason why they get eggbound because they can pass eggs that are large as long as their muscles are in good shape (which requires the bird flies every day). We are taking her to a specialist tomorrow to collapse the egg, because the current vet doesn't feel comfortable enough to do it. I have her home now, and if things turn out INCREDIBLY well, she can pass the egg tonight. However, in the case that doesn't happen, we'll see if that fixes everything. Is egg binding common in birds laying their first egg? She hasn't pushed since the first day and I feel like it's at least worth a shot, to avoid the danger of the procedure and the bill. She may not be able to push it out, but the vets said the egg was in a "better position" today, according to x-rays. Last edited by baven on Sun May 07, 2017 9:23 pm, edited 1 time in total. I am so sorry that your bird is going through this. It must be very uncomfortable. Things are moving very slow don't you think? I don't know to what kind of vet you took this bird but I have never, ever heard of waiting in an eggbinding case. The problem is that once the egg is in position, they can't pass poop and, I don't want to alarm you but this is fatal after just a number of hours. Birds that get eggbound is always because of lack of calcium in their diet - usually caused by feeding seeds and no supplements but I've known a number of birds that got it with pellets. The lack of calcium causes the eggshell to remain thin - the shell is done in layers of calcium and, as there isn't enough of it, it remains thin and soft and, because of this, the muscles cannot push it out. But she could have dystocia and not eggbinding... not that dystocia is not fatal same as eggbinding. Please, I beg you, do NOT wait, take her to an avian vet clinic that has a 24/7 emergency. I managed to get her in to a vet specialized in collapsing the egg, and it turns out the reason she couldn't pass it was because it formed about 3 times bigger than normal eggs. Insane. They couldn't remove the broken down shell from her just yet, but because it's significantly smaller they have no worries that it'll finally pass. She's still loopy from the procedure as well as the pain killers administered, but once she moves past that I'll be doing everything I can to encourage her to pass the remnants. That is, if she tries pushing. I have her in a hot, humid room, but she's exhausted from the anesthetic. We injected oxytocin (I believe) in her to help with contractions but if she's too tired, I worry that she won't even try to push. If she doesn't by Tuesday, she'll have to go in for a surgery, which is threatening by itself. Hopefully, that won't have to happen, but if it does we might have to get her spayed as well to prevent this from ever happening again. I've read spaying can be dangerous but at the same time this has been a very expensive past few days and I don't think I'd be able to help her if egg binding would be the case for every egg afterwards. The vets said she could be prone to forming irregularly sized eggs, which would be horrible. So, that brings up another question- how safe is spaying for birds, if this would have to be the case? Oh that poor baby. I can't even imagine what she is going through. I am a little upset with your vets for not going into action right away. It seems to be that she is getting less care because she is a Cockatiel and not a Cockatoo. This has really gone on too long. I can't help you on the safety of spaying them as I've never had it done on any bird I've had. I've never had a single eggbound bird or even one that laid a soft shell egg and the ones that came to me as chronic or off-season layers all became normal once they were put under a strict solar schedule and a good diet.